This magnificent colt is by a leading New York sire and a well-bred mare. 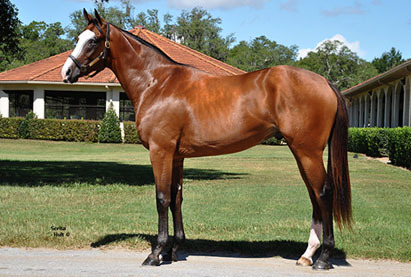 He has the breeding to to run on any surface and compete at classic distances. GiveTheMan a Cigar is entered to run in Saturday�s 3rd race at Aqueduct which is a Maiden Special Weight going 1 mile for 3-year-olds and up. He drew post position 4 and jockey Dylan Davis is named to ride. Davis is currently ranked 3rd in the Aqueduct jockey standings with 50 wins and a 16% winning percentage. GiveTheMan a Cigar is currently the 9-2 Daily Racing Form morning line third choice in the race. First race post time is 1:40 PM and GiveTheMan a Cigar's race is Race 3 which is scheduled to go off at 2:30 PM. As always we�ll be in the exclusive Horseman�s Lounge. Everyone is invited to join us at Aqueduct for a fun day of racing. GiveTheMan a Cigar breezed on Thursday working 4 furlongs in 48.55 over the Belmont Park training track. That work was 16th best out of 44 at the distance. Chris is pointing GiveTheMan a Cigar to the Maiden Special Weight going 1 mile at Aqueduct on March 31.